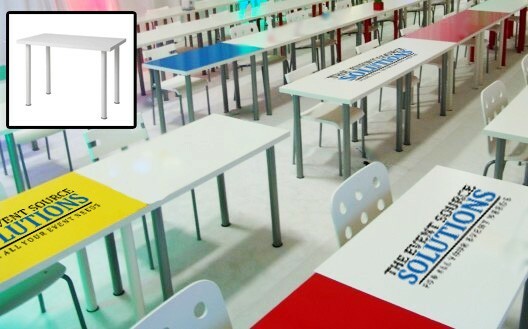 These tables can be branded with a variety of colors that allow a ‘staggered’ look of modern design. Companies can also display logos, meeting notes, or even keywords to help reinforce the underlying message of the event. Share tables and seated tables are also integrated into the mix to create a structured but elegant atmosphere. These elevated tables offer a ‘break’ to the room design to help deviate from traditional classroom seating as well as promote an open sharing environment for information and creativity. Custom logos start at $75.